The Trust will have more than 400,000 square feet of development rights from Pier 40 left after the St. John's deal. HUDSON RIVER PARK — The Hudson River Park Trust hopes to use some 400,000 square feet of development rights tied to Pier 40 on the pier itself, Trust CEO Madelyn Wils said at a meeting Monday night. Wils said the Trust's board of directors believe office space could be the best use for the development rights (also known as air rights) remaining after 200,000 square feet are sold to the owners of the St. John's Terminal across the West Side Highway from the pier. "Offices would be something that would generate revenue and I think it's something that could actually help the Trust's finances," Wils said. "The intention of everybody would be to keep the air rights on the pier [rather than transfer them across the highway to a developer]. That's what we prefer." Wils said using the development rights for office purposes would require an amendment to the Hudson River Park Act, the document that created the park and stipulates that it must be financially self-sufficient. The St. John's deal is still pending approval through a lengthy public review process known as ULURP, in which the local community board, the City Planning Commission, the Manhattan Borough President and the local City Council member all get to weigh in on its specifics. After the ULURP is complete, the Trust will vote on the sale of the air rights, currently priced at $100 million. They will also hold a public hearing and comment period. The revenue generated from that deal can only go to repairing the decaying pier. Marc Boddewyn, the Trust's vice president of design and repairs, said they expect it to take four years to complete all of the necessary work, noting that work on the piers cannot typically occur during winter. They plan to bid out different areas of work every year separately for better pricing and to foster competition, Boddewyn said. They believe there will be no need to close the much-used ballfields. The main priority are the rotting piles holding up the pier. Boddewyn said those will be repaired by teams of divers, usually about four per crew, who can typically get through as many as 500 piles in a year. Approval of the St. John's deal is likely, given the potential deal was announced with the blessing of local Councilman Corey Johnson, and the chair of the City Planning Commission, Carl Weisbrod. Public schedules and email correspondence obtained by DNAinfo New York showed that the city was involved in shaping the deal from the earliest weeks of Weisbrod's tenure as City Planning Commissioner. Meetings and correspondence with the developers, Atlas Capital Group, included Department of Housing Preservation and Development Commissioner Vicki Been and Deputy Mayor Alicia Glen. 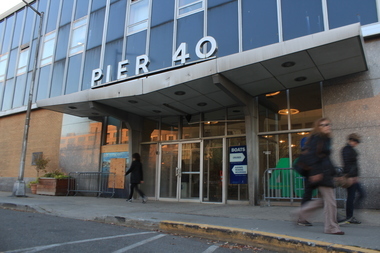 Pier 40 is one of a handful of piers that the Hudson River Park Act designated as "commercial." It is zoned for manufacturing. Other piers with development rights include Chelsea Piers (Piers 59, 60 and 61), the Circle Line piers (81 and 83) and the Con Edison pier (98). Any transfers of air rights from any of those piers would require a new ULURP.